Dale Earnhardt Jr. was fighting his way back up to the front during tonight’s Coke Zero 400 at Daytona International Speedway. He was already back on the lead lap after hitting the wall near the end of Stage 2, but then a big crash in Stage 3 put him back into the wall and ended his race tonight for good. Ouch. Kevin Harvick’s No. 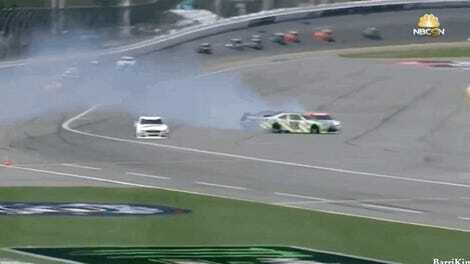 4 lost a tire on lap 106 and spun out of control, leaving Earnhardt’s No. 88 nowhere to go. 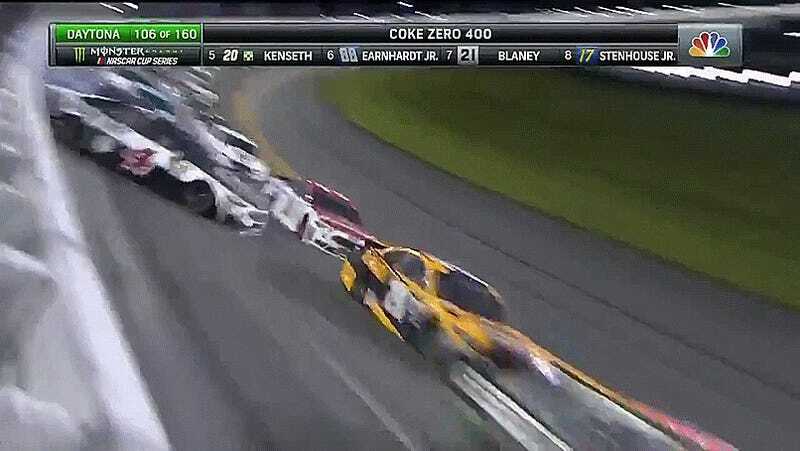 Several other drivers, including Brad Keselowski ane Kasey Kahne were caught up in the mess. Earnhardt was on an incredible comeback run, having worked his way back up to sixth place at the time. He had started the race from pole position. Earnhardt had some suspension damage following the incident that kept pushing him back into the wall. His team tried to repair the No. 88 car in put lane but ultimately sent him to drive around into the garage, as it was too much for them to repair in the short window of time NASCAR allows for in-race repairs. It’s hard not to feel gutted for Earnhardt given that he won’t get another shot at a win at Daytona before retiring at the end of this year. But that’s Daytona—one of the most contact-heavy races on the NASCAR calendar. Earnhardt has won here a whopping 18 times in various series, so I’m sure he’ll be fine.